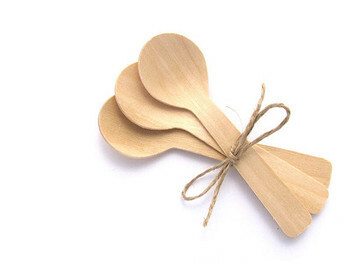 The disposable plates are made of thickened pulp, and the forks & knives are made from birch wood. Eco-Friendly, compostable, recyclable and biodegradable. Premium quality – durable and lightweight. Sturdy and leak-free, perfect for both hot and cold food. Ideal for any indoor and outdoor parties, Thanksgiving, Christmas and other Holidays, wedding dinner, birthday, camping, picnic, farmers market, etc. For up to 50 guests. Make your party memorable and impactful with this dinnerware, as a modern and stylish alternative to the plastic disposable options. These plates are the perfect size for serving generous portions and saucy meals. This cutlery set provides you with the convenience of disposable dinnerware without the harm to the environment. Keep plastic and other harmful materials out of our landfills, one plate at a time! Useful tips – after use, please place the utensils into your compost bin or biodegradable trash cans, where they will naturally degrade into nutrient-rich organic materials when disposed of with other compostable items, leaving no visible or toxic residue. These are also compostable in any industrial composting facilities.